Weekly Objective: After analyzing SYMBOLISM of the “pachuco” in Luis Valdez’s play Zoot Suit students will be able to identify themes about identity conveyed by internal and external conflicts of the play’s plot. Essential Question: Is the “pachuco” in Luis Valdez’s play Zoot Suit a symbol of self affirmation or fulfillment of outside stereotypes and expectations? 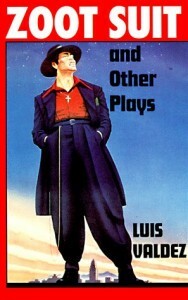 Wednesday: Reading Play and Analysis Map and Notes for ACT I Watch Zoot Suit by Luis Valdez, the “pachuco” as trickster. Friday: Give One Get One and Gallery Walk to analyze the symbolism of the archetype of the “pachuco” in Luis Valdez’s play Zoot Suit. TIMED WRITE ON ZOOT SUIT ON MONDAY! Quickwrite 1: To what extent do advertisers influence your choices regarding the amount of water, flavored drinks, processed foods, meat, fish, fresh fruits, vegetables, fast food, sugar, and the like that you feed your body? Quickwrite 2: Evaluate your own dietary habits, and discuss whether and in what ways you might change your diet. Quickwrite 3: Consider what you know about the foods you eat, their origins and their quality. How much do you know about your food? Quickwrite 4: Think about the amount of time and the quality of the time you spend eating. Do you drive and eat? Do you stand or walk while eating? Discuss how often you sit with your friends and family and enjoy the food that you eat. Quickwrite 5: Certainly we all are responsible for what we put into our mouths, but at what point do we assume responsibility? At age five, ten, fourteen, eighteen, twenty-one? When (at what age) does a parent’s responsibility end and an individual’s begin? Tuesday: Guest Speaker, Sara Guerrero, Creative Director of Breath of Fire Latina Theater and Conservatory Teacher at South Coast Repertory Theater, Last year Sara served as project director for “Dialogue/Dialogos SCR,” a two-year effort with playwright José Cruz González which built a play around stories shared by regular people in the Latino community of Santa Ana. Announcements: CAASP Testing Monday-Thursday Notebooks Due Friday, Finish “Death of A Salesman” Reading Check on Friday! HOMEWORK: Read Death of a Salesman and answer “Understanding the Surface Story” Questions of the Penguin Reading Guide for Act 1-2 and Requiem. We will discuss the play on Friday. Friday: “I Have A Dream” by Dr. Martin Luther King, Jr. Notebooks Due Today! What do you learn about Cleófilas in the very first section of the story, which is told as a flashback? What are the contrasts between “then” and “now” that Cisneros establishes in this section? How does becoming a mother change Cleófilas’s outlook on her situation? Does she defineherself through motherhood? Explain. How does the assumption that “to suffer for love is good. The pain all sweet somehow. In the end” (para. 8) help shape Cleófilas’s behavior? Does she ultimately reject this view? How can you tell? Why didn’t Cleófilas behave as she thought she would when Juan Pedro first struck her? Why do you think she was “speechless, motionless, numb” (para. 24)? What is the importance of the character of Maximiliano? What does Cleófilas’s perception of him tell us about her? In her new home in Texas, Cleófilas lives between Dolores and Soledad. In Spanish, dolores means “sorrow” and soledad means “solitude.” What does the author’s choice of these names for neighbors suggest about Cleófilas’s life in this Texas town? What other evidence can you find to support this interpretation of Cleófilas’s life in Seguin? How does Cisneros portray the situation of both men and women—the community in general—who have immigrated to the United States from Mexico? Judging from the depiction in “Woman Hollering Creek,” have they found a better life than the one they left? Why doesn’t Cleófilas want to return to her father’s home in Mexico? Describe the various “ways out” she considers over the course of the story. Why does she finally decide to return to Mexico? Why are telenovelas important in this story? What role do they play in women’s lives? How do they affect Cleófilas’s views about love and relationships? Explain the role La Gritona (Woman Hollering Creek) plays in the story. What does it symbolize? How does the meaning of the symbol change over the course of the story? Weekly Goal: Students will identify how Mexican American author’s use allusions subvert gender codes conveyed by Folk traditions. TOPIC SENTENCE: What is your view of the argument presented in the article? EVIDENCE: Cite the article and defend your position as it relates or compares to the quote. Use evidence to support your own views. COMMENTARY: What is the importance of the topic and your ideas as it relates to the world around you?